Somehow I totally forgot to post this here: but after the Zuma launch and subsequent rumours of a failure made headlines, I was interviewed by Mary Beth Griggs of Popular Science magazine. It resulted in a very nice article about our amateur tracking activities, that you can read here. 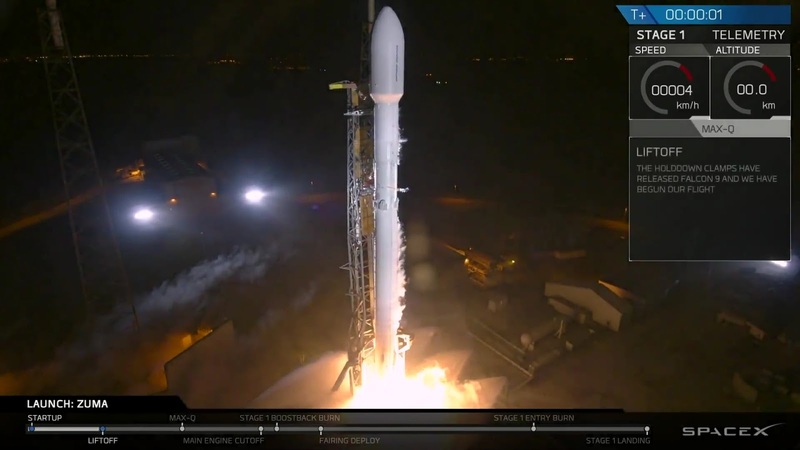 SpaceX's launch of the Zuma satellite on 8 January was interesting, and not just because of the ongoing saga of whether it failed or not (see a previous post). The odd 50-degree orbital inclination is another element that made this launch interesting (see discussion in my pre-launch post here: sightings of the Falcon 9 Upper Stage over Sudan after launch later confirmed this orbital inclination). New ideas started to form post-launch after the Falcon 9 sightings from Sudan made me realize that while it indeed was launched into a 50-degree inclined orbit, the orbital altitude (900-1000 km apogee) was higher than I initially expected, making a proposed link to USA 276 unlikely. And then @Cosmic_Penguin posted this small message thread on Twitter, referencing this interesting publication. That struck a chord and reinforced an emerging idea about a potential role for satellites in such 50-degree inclined, ~1000 km altitude orbits. As @Cosmic_Penguin notes, the publication specifically discusses ~50-60 degree inclined, ~1000 km altitude orbits. And it is all about Space-based Radar. I had just been looking into the coverage of the Zuma orbit, and it lines up with content in that report. The map below is a ground coverage map of Zuma, would it have been alive and well. One of the uses of a ~50 degree inclined ~1000 km altitude Space Based Radar satellite mentioned in the report, is for shipping surveillance. Indeed, a satellite in a Zuma-like orbit would basically cover all Ocean surfaces, except for the high Arctic and Antarctic, which are not that interesting for the purpose discussed below (moreover, the Arctic is extensively covered by groundbased and airborne radar). For all of this, explanations can be sought, but that admittedly all is "special pleading". For example, maybe the secrecy is there because the mission involves cutting edge experimental Radar technology. Or the secrecy could simply be the result of the "secrecy cult" in some parts of the US Government going over the top. Or it could point to operation by an Agency that wants to keep this operation on the down low - e.g. the CIA. And I can think of a few more - much more outlandish, which is why I won't mention them here - potential reasons. We have seen this kind of secrecy before with PAN (and its later sister ship CLIO), with Prowler, and more recently with USA 276. All of these were experimental satellites doing unusual things: PAN roved between, snug up to and eavesdropped on commercial geostationary satellite telephony satellites. Prowler was an experiment for covertly inspecting other geostationary satellites on-orbit. And USA 276 remains mysterious but a series of very close encounters to the International Space Station suggest it might be a technology demonstrator for observing rendez-vous manoeuvres in space. Zuma (the more so now it might have failed) also strongly brings the infamous USA 193 satellite to mind, although there we do know that it was a satellite for the NRO, and likely an experimental radar satellite [edit: see added note 2 below]. 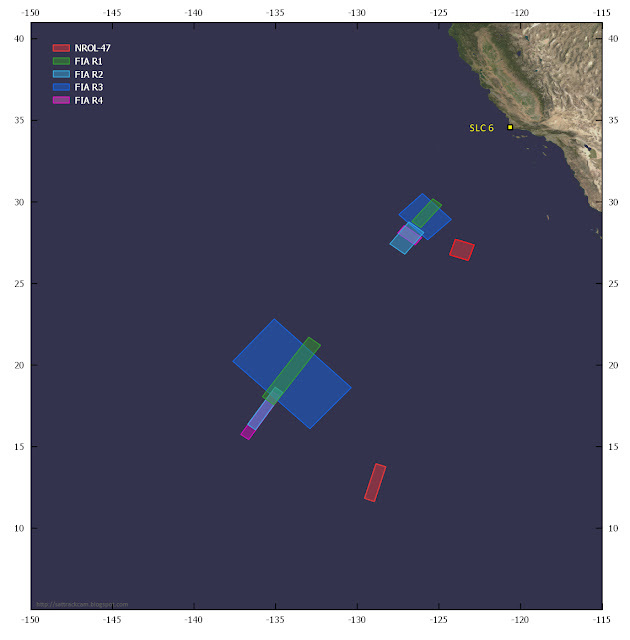 Nevermind what Zuma really was meant to be, and who was to operate it: the message to take home is that High Seas shipping surveillance is a potential and viable role to keep in mind for any future satellite launched in a ~1000 km altitude, ~50 degree inclined orbit. Added note 1: Cosmic Penguin pointed out to me that this was also earlier brought up in a forum post by Ed Kyle. "Second, the Northrop Grumman satellite may be a follow-on to another failed satellite US 193. [...] ...., a source with direct knowledge of the program told me it was a blend of radar and electro-optical and would not provide any more detail than that. A source with wide knowledge of classified space programs has told me that the Northrop Grumman-built Zuma may be the next iteration of this. Both were apparently experimental satellites, in that they were not part of a large constellation of similar satellites." Such a spacecraft would be well suited for the purpose indicated in this blog post. Also, Northrop-Grumman, the company that built Zuma, has actually worked on developing ideas for Space Based GMTI Radar, which again would suit well to the purpose I suggest in this blog post. Acknowledgement: Hat Tip to @Cosmic_Penguin on Twitter for putting ideas into my brain. UPDATE 10 Jan 17:25 UT: The launch has been scrubbed due to high altitude winds, and moved one day to Jan 11. New start of launch window is given as 1 pm PST = 20:00 21:00 UT. 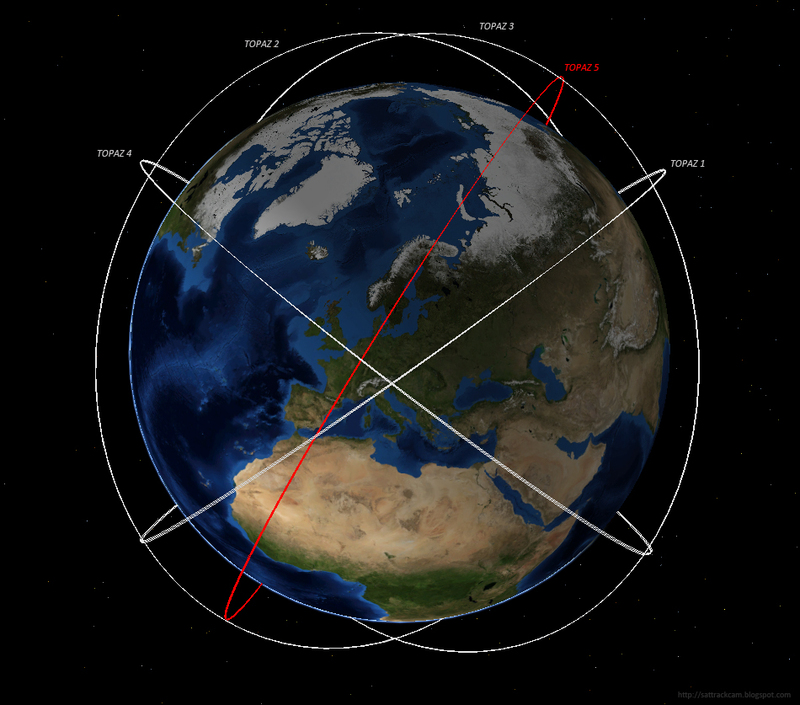 This means the launch window is shifting, indicating a prefered orbital plane and launch probably right at the start of the launch window. Update 12 Jan: The launch was again scrubbed yesterday, and is now slated for January 12, 21:00 UT . My remark about a shifting launch window above was in error, I missed that the Maritime Broadcast Warning window opens somewhat before the actual launch window opens. Final Update , 12 Jan: NROL-47 successfully lifted off from Vandenberg SLC-6 at 22:11 UT! 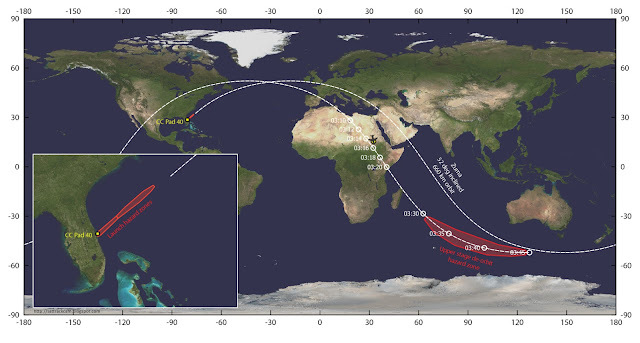 Final Update 14 Jan 2018: Amateur observers using radio have located NROL-47 in orbit. It is transmitting in the TOPAZ frequency, 2241.52 MHz. The orbit is still very preliminary but appears to point to ~1100 km orbital altitude and an orbital inclination of ~105-106 degrees. This would identify NROL-47 as a new TOPAZ, but in an orbital plane that differs from the previous four TOPAZ satellites. Due to bad weather at the observing sites of several of our active observers (I was clouded out yesterday evening myself for example), optical observations have not yet been reported. Hot after the excitement and drama of the Zuma launch (see my previous post), a new classified launch is upcoming on Wednesday January 10, when ULA will launch NROL-47, a classified payload for the National Reconnaissance Office (NRO), on a Delta IV from Vandenberg SLC-6 in California. The launch is in Westward direction, into retrograde orbit. 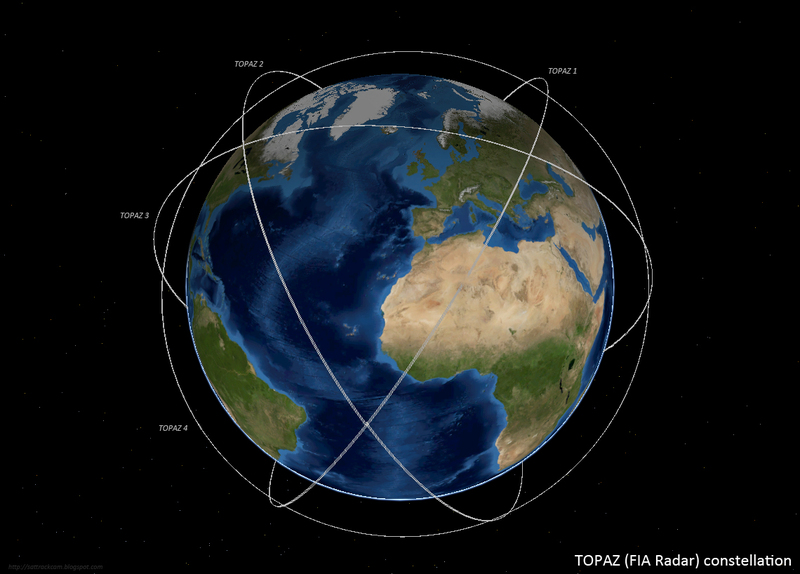 This has led some space news websites to assume that the NROL-47 payload is the 5th TOPAZ (FIA Radar) satellite. But is it? I have some doubts. If it is TOPAZ 5, then it is clearly a deviation from the previous four launches. The launch hazard zones from published Maritime Broadcast Warnings show that the launch azimuth is different - previous TOPAZ missions all launched into azimuth 220 degrees, but NROL-47 launches into azimuth 200 degrees, a 20 degree difference. This can be clearly seen on the map above, where the NROL-47 hazard zones are in red, and the hazard zones from the four TOPAZ in purple, green, light blue and dark blue. The azimuth and locations of the zones from the four TOPAZ launches are all quite similar, but those of NROL-47 stand out as different. All the four TOPAZ satellites are in a 123.0 degree inclined retrograde orbit. 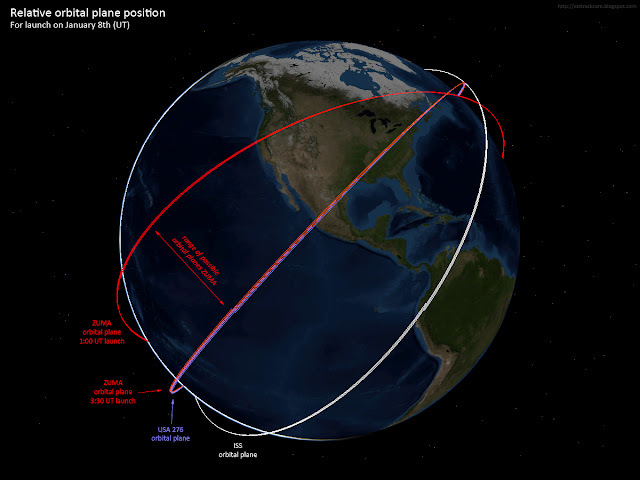 The NROL-47 launch azimuth results in a retrograde orbit too, but with an orbital inclination of 108.6 degrees, not 123.0 degrees: a 14.4 degree difference. So if this is the 5th TOPAZ launching as NROL-47 on Wednesday, then it is going into a quite different orbit compared to the previous four TOPAZ: different in orbital inclination as well as in orbital altitude. 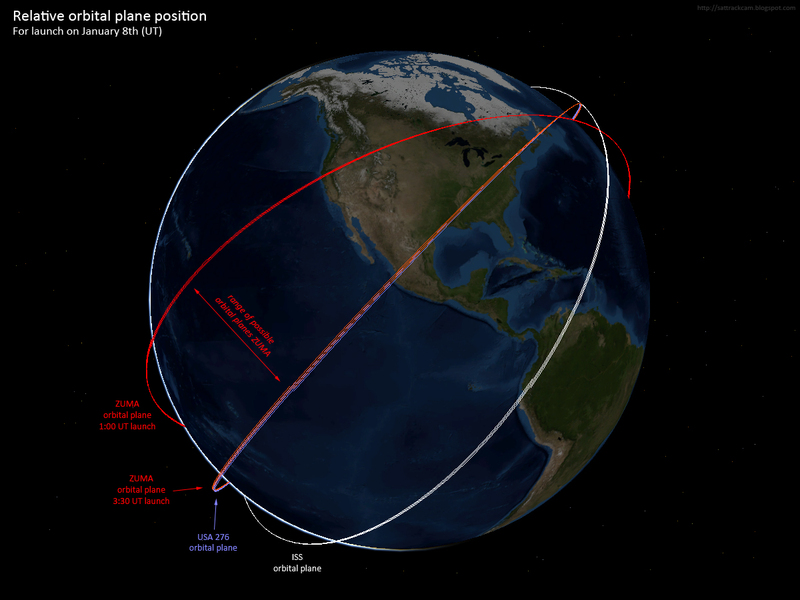 In theory, the Delta IV rocket could do a "dogleg" and (when launching at 20:30 UT) deliver the NROL-47 payload into the 123.0 degree inclined orbit close to the orbital plane of TOPAZ 1 (FIA Radar 1). A second manoeuvre near the south polar pass could then align the RAAN and bring it exactly into the orbital plane of TOPAZ 1. But why do that, if previous TOPAZ launches simply launched directly into the 123.0 degree inclination orbit? The deliberate re-entry of the Upper Stage happens 1.5 revolutions (2h 55m) after launch. Estimated search orbits, based on a 108.6 degree orbital inclination, are here. 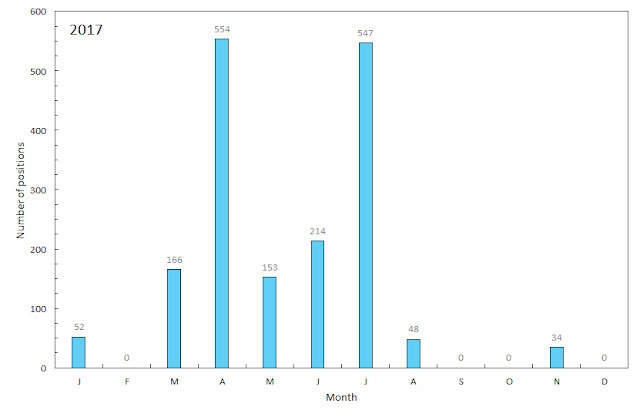 New elset estimates for the new launch date and time are here. 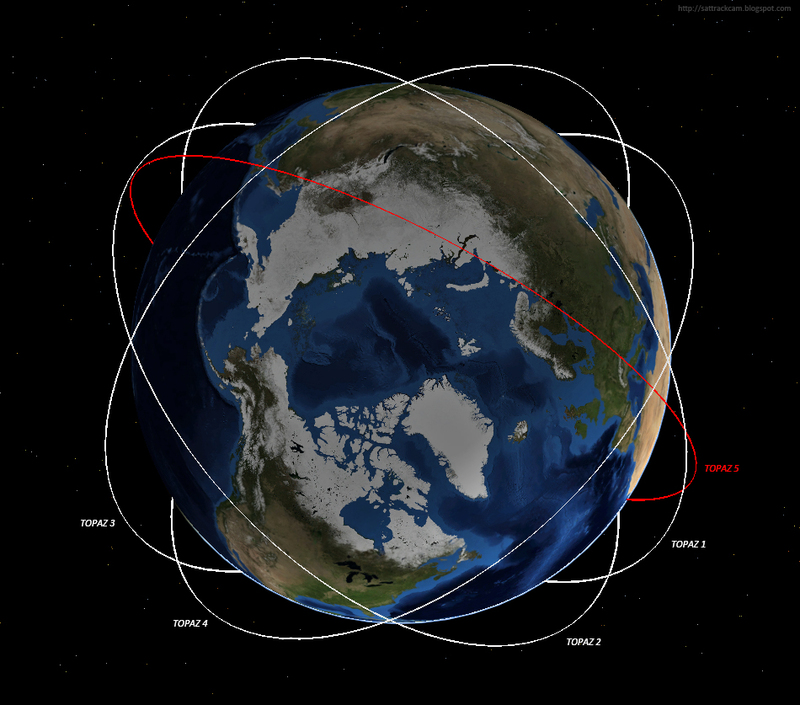 South Africa will have two visible passes after launch. An UPDATE on this post, with post-launch imagery of the payload in orbit, is here. The spectacular image above was taken by Peter Horstink, the Dutch pilot of a Boeing 747-400 freighter aircraft (Martinair Holland flight MPH8371 from Amsterdam to Johannesburg), around 3:15-3:20 UT on January 8. 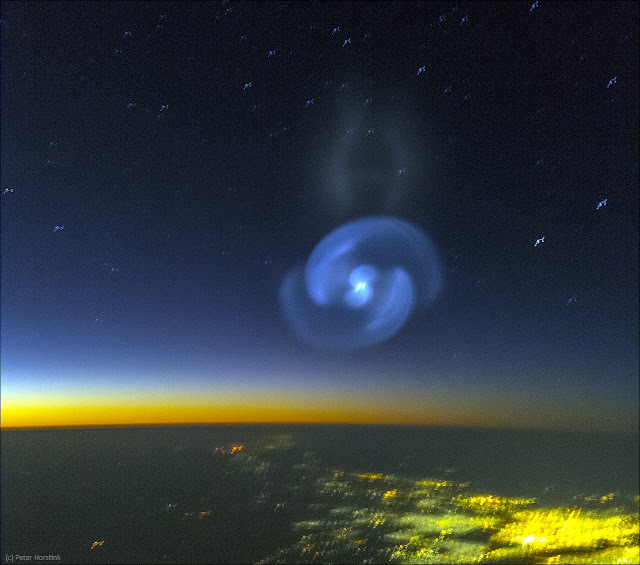 The aircraft was flying at 35000 feet just north of Khartoum, Sudan, at that moment, which can be seen in the foreground (the yellow lights). The image above is the first one out of four images taken by Horstink. The spectacular green-blue "spiral" on the image is, given time and location and character, almost certainly the Falcon 9 Upper Stage from the launch of the classified Zuma satellite that day (see my earlier post here), depressurizing and venting fuel at the end of its de-orbit burn. Some 15-25 minutes later, it would re-enter in its designated re-entry zone in the southern Indian Ocean (see map below). "It started with a greenish light in the top of my front window. At first I thought it was a reflection from some lightsource behind me, but it turned out not to be. At about 218 UTC [this later turned out to be a mistake and must read 3:18 UTC: the aircraft passed Khartoum near 3:25 UTC - ML] with a very clear sky and with Khartoum in our sight, a point of light (like a star but somewhat bigger) moved from above us to South of us. 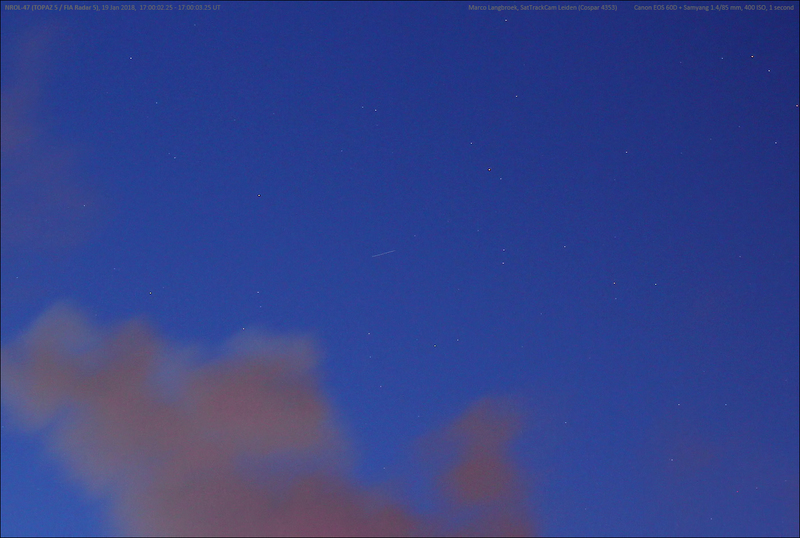 It moved slower than a usual satellite but clearly did move. I estimate we saw it for 2-3 minutes. The waning moon crescent at that time was almost right above us. The object was surrounded by a greenish glow in the shape of spiral arms, like a spiral galaxy. Two of them, which didn't seem to move much. The total size of the phenomena was about three times the diameter of the moon." 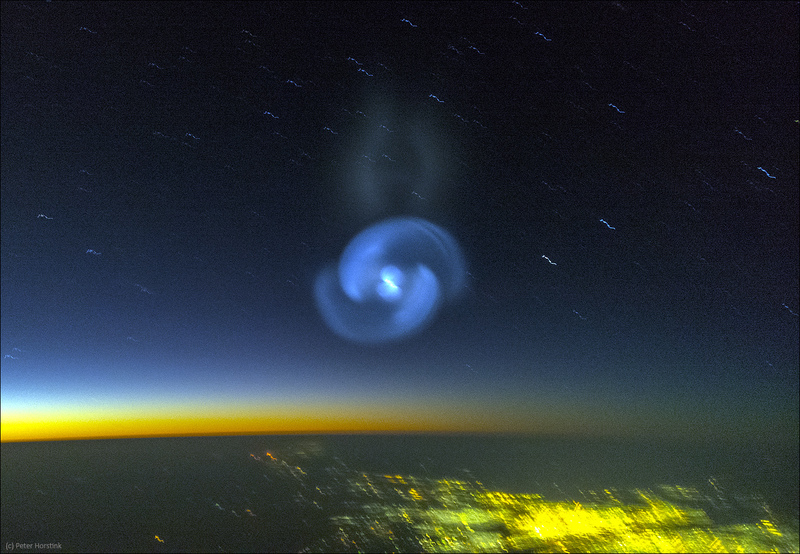 (note that when measured from the photographs using the star background as a reference, the actual diameter of the spiral cloud is about 11 degrees. The cloud is at ~8 degrees elevation over the horizon, near azimuth 155 degrees. The two bright stars to the right of the cloud are alpha and beta Centauri ). The map below gives my estimated trajectory for the Falcon 9 Upper Stage, with apogee at ~900 km. 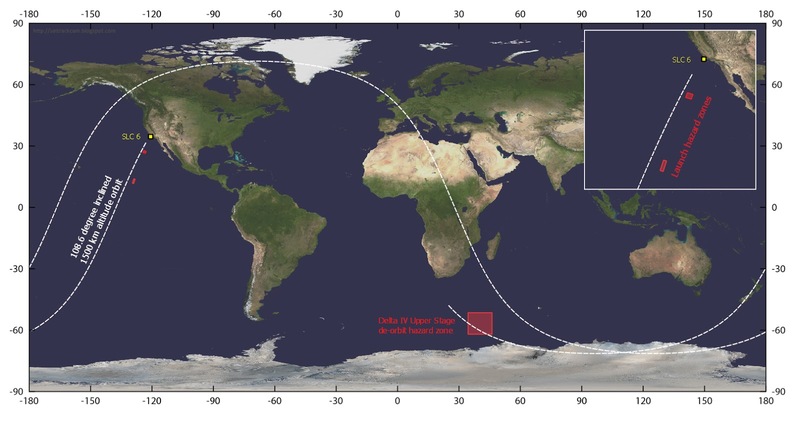 It fits the area of the sighting, the launch hazard zone direction and the de-orbit zone position (from Maritime Broadcast Warnings) in the Indian Ocean. The Falcon 9 Upper Stage should have re-entered into the atmosphere between 3:30-3:45 UT, about 30 minutes after the window from the Maritime Broadcast Warning opened at 3:00 UT. The sighting points to a somewhat higher orbital altitude for Zuma than I had anticipated before the launch: with hindsight, I had too much of an idée-fixe that the orbital altitude would be similar to that of USA 276. The Falcon 9 sighting over East Africa suggests an altitude over double as high, in the order of 900-1000 km rather than my original 400 km estimate. The sighting does confirm the 50-degree orbital inclination of the orbit. 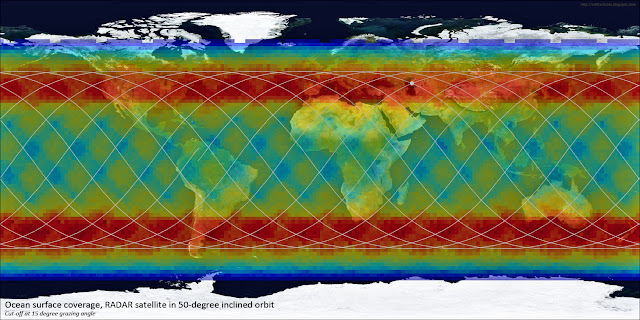 A new estimated elset based on this revision of the orbital altitude is here. Horstink made the image above and below plus a few more with a handheld camera, from the cockpit of the aircraft. 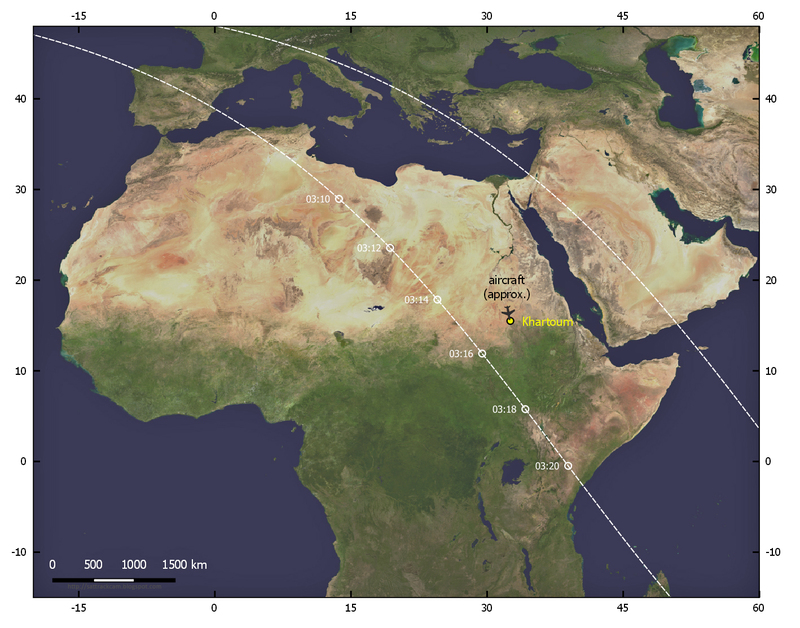 The sightings from Sudan near 3:15-3:20 UT are significant, as in the late afternoon of the 8th, rumours appeared on Twitter of a Zuma launch failure. These rumours then were picked up by some news outlets, e.g. here and here. I have no idea about the veracity of these rumours, and so far SpaceX has said the mission was "nominal" (indicating no problems with the Falcon 9), while Northrop-Grumman and the US military haven't given comments (they never do about classified mission status). They could very well just be rumours, perhaps born out of a misunderstanding of events in the launch seen from the ground by lay observers. For the moment, unless the US Government comes with some statement, I think it is wise we should treat it as "just rumours", and not necessarily true. The sighting of the Falcon 9 Upper stage venting 2 hours 15 minutes (1.5 orbit) after launch, bear significantly on the discussion, as it seems to confirm the remarks by SpaceX that the mission was nominal. Of course, for SpaceX the mission ends at orbit insertion. At any rate, it shows that at least the Upper stage achieved orbit (so it was definitely not a launch failure where the rocket failed to achieve orbit), and it makes sense that the payload then did as well. (3) Zuma achieved orbit with the Upper Stage, but failed to detach from the Upper Stage, and next de-orbitted with the Upper Stage near 3:30-3:45 UT. JSpOC ("NORAD") did enter an object from this launch into its master catalogue on January 9th, as object nr. 43098, COSPAR 2018-001A, name USA 280. They designated it "PAYLOAD" (and the USA 280 designation would point to this as well). As usual for classified missions, they do not give details on the orbit. This suggests something achieved orbit long enough (i.e. over more than one orbit) to be detected and added to the catalogue. While this does not necessarily mean the object is still in orbit (and it could in theory reference the Falcon 9 Upper Stage, with the "PAYLOAD" designation then in error), it does fuel my skepticism towards the truth of the rumours. If Zuma is on-orbit but did fail, the situation becomes reminiscent of the USA 193 saga - an experimental satellite launched in December 2006 that failed after orbit insertion, and a year later was shot out of the sky with an SM3 missile, which has become infamous as "Operation Burnt Frost". With regard to the observed fuel dump/depressurization: this is normal for most launches and does not necessarily indicate something's wrong. Rocket stages always carry excess fuel, as you don't want the engine to cut out prematurely by running out of fuel. So it always has a sufficient fuel margin. Once its work is done, this excess fuel is often vented, also known as "depressurization". Depressurization and fuel venting avoids the risk of the rocket stage blowing up, for example as a result of static electricity building up in the rocket stage. You do not want your rocket stage to blow up, as it creates an uncontrolable swarm of debris and includes the risk that particles are ejected into orbits where they do not decay quickly, adding to the space debris risk. The spiral pattern results when the rocket stage is spinning, perhaps as result of the fuel vent. At the moment, Zuma is not visible from the Northern hemisphere because all passes are in daylight or earth shadow. This will change 1-2 weeks from now, depending on the exact orbital altitude. The sighting from Sudan does confirm the orbital plane the object should be in (that is: unless it did a manoeuvre into another orbital plane after separation from the Falcon - but I doubt that). So we have to wait now untill a new object is observed in this orbital plane. 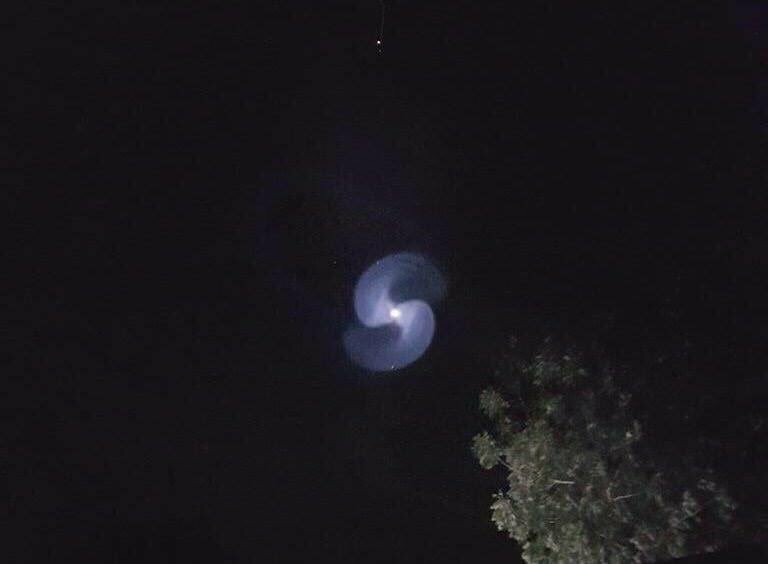 UPDATE: some news sources are now claiming sources within the US military and US Government confirm the failure, saying the second stage of the Falcon 9 "failed" and stage and satellite crashed into sea. This does not tally with the observations over Sudan, which show the Upper Stage did reach orbit. So my skepticism remains. If there is some truth to it nevertheless, it could point to option (3) above and subsequent misinterpretation in the press. UPDATE 2: the adapter mating ZUMA to the Falcon 9 Upper Stage was not made by SpaceX, but by Northrop-Grumman itself (which is somewhat unusual). So if ZUMA did not separate from the Falcon 9 (and did a dive into the Indian Ocean with it), the blame is not on SpaceX but on Northrop-Grumman. In that case, the SpaceX declaration that the Falcon 9 performed "nominal" is correct, even if Zuma did not separate from it. UPDATE 3 (17 jan 2018): It turns out that a ~52 degree inclined, ~660 km altitude orbit also fits the constraints of the de-orbit area and being over East Africa at the right time. So we are adding that option to the search efforts. I did a partial plane scan of the 50-degree orbital plane two days ago. Ackowledgement: I thank Peter Horstink for his report, for providing additional information on request, and for the permission to feature his images on this blog. I thank Govert Schilling for bringing me into contact with Peter Horstink. The photographs with this post are (c) Peter Horstink. The year 2017 was a good year in as far as my satellite observations are concerned. 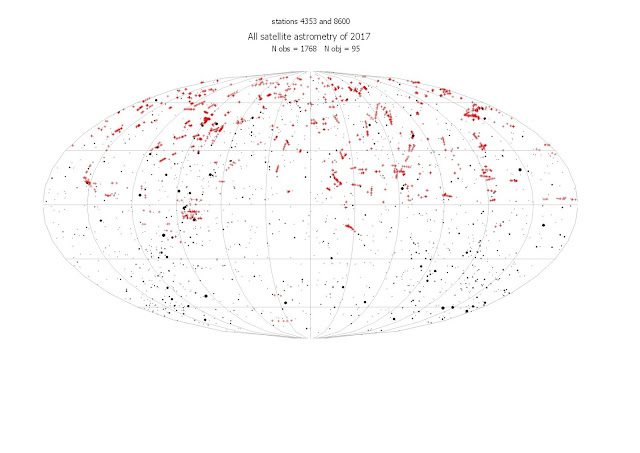 I measured 1768 positions (see map above), on 95 different objects. 1715 of these were measurements on my own imagery from station 4353. Another 49 were on images taken by Paul Camilleri (station 8600) in Australia; and 4 were on imagery taken by Alain Figer in France. The diagram below shows the distribution of observations over the months. The year 2017 was an interesting year, with interesting new avenues and quite some press attention. 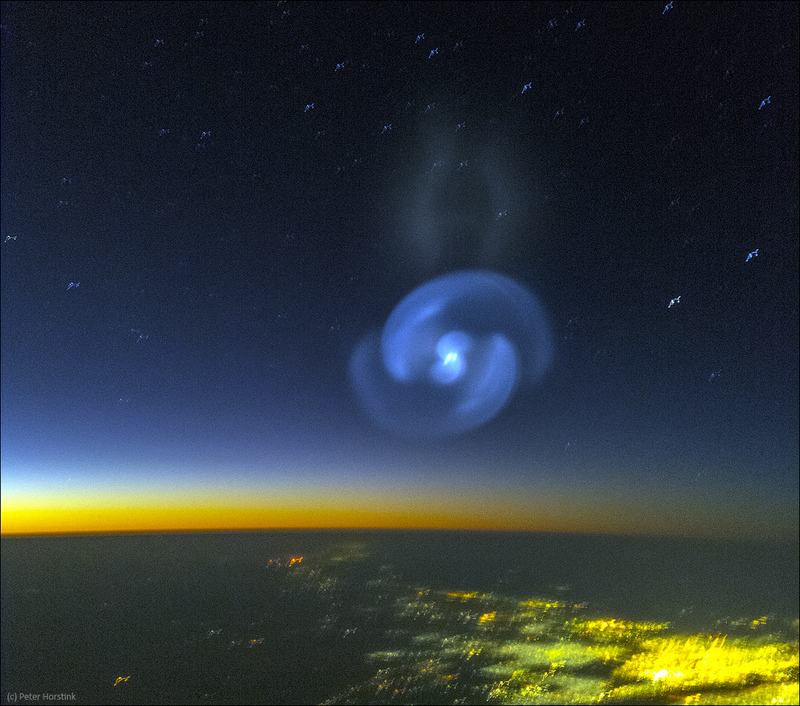 We chased a couple of new launches, of which NROL-76 (USA 276) was a peculiar one. I also started to give some serious attention to the analysis of North Korean missile tests. I started to use new video software for the observations of objects in LEO in 2017, which increased the output and the accuracy of positions. Objects in HEO and GEO are still photographically imaged. Medio 2017 I became a consultant in an interesting Space Situational Awareness project for the Space Security Center of the Royal Dutch Air Force. 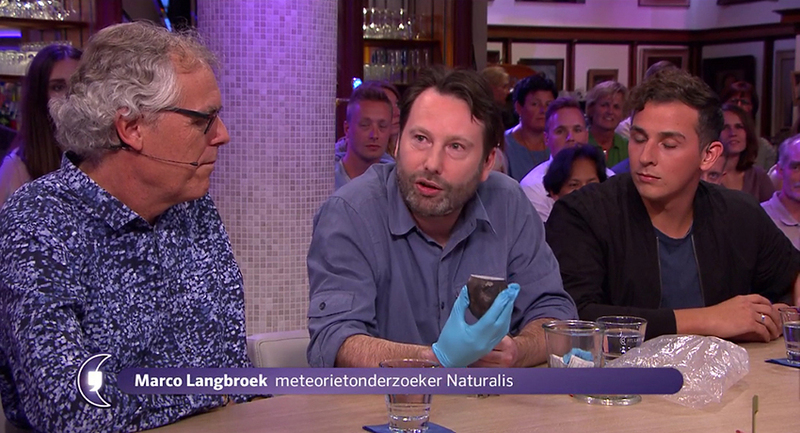 As part of this project I was temporarily employed at the Department of Astronomy of Leiden University. In July in The Space Review I published an analysis of NROL-76 (USA 276) and its weird flyby of the International Space Station early June 2017, that generated some press attention. Late 2017, my analysis of North Korean missile test launch imagery generated press attention too. In December, I was interviewed by the Volkskrant (a major Dutch newspaper) about whether or not an "Arms Race in Space" was upcoming. Unrelated to satellites, I was involved in the identification of the 6th meteorite of the Netherlands, Broek in Waterland,an L6 chondrite, in February, which we presented at Naturalis (the Dutch National Museum of Natural History) in June 2017. This resulted in me being a guest in the Live RTL Late Night TV show on national television. All in all, quite a remarkable year!